Atilla: the hundred watt amplifier from Gryphon | What Hi-Fi? The volume control is via a microprocessor-controlled 50-step attentuator, the toroidal transformer is from Holmgren, and the amp has a front-panel display of input selection and volume. The onboard memory is upgradeable using a PC to reprogram the flash memory. 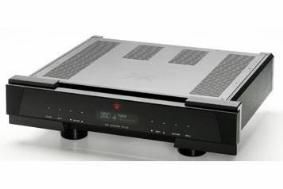 A single balanced input is provided, along with four more inputs and an output, and the amplifier has a fixed-level throughput, bypassing the volume control, for use with an AV processor. There's also an optional moving magnet/moving coil phono stage. Gryphon says of the amplifier that "Detail, natural ambience, musical involvement and luxurious build quality make for the Atilla's irresistible combination. "For the next decade it will assure Gryphon's continued dominance of the industry at the pinnacle of authentic musical reproduction." The Atilla, along with the rest of the Gryphon range, is available in the UK exclusively from Glasgow-based retailer The Audio Salon.